↑ "March of Civilisation". The Argus (The Argus Office, Melbourne Victoria): p. 5. 7 September 1909. http://nla.gov.au/nla.news-article10731938. अन्तिम पहुँच तिथि: 29 November 2009. 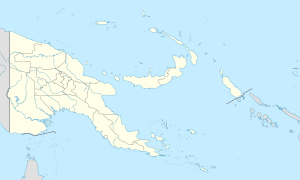 ↑ "Progress in Papua". The Argus (The Argus Office, Melbourne Victoria): p. 12. 5 September 1925. http://nla.gov.au/nla.news-article2133340. अन्तिम पहुँच तिथि: 29 November 2009. ↑ "Department of the Interior: Tenders". The Argus (The Argus Office, Melbourne Victoria): p. 18. 25 January 1941. http://nla.gov.au/nla.news-article8184170. अन्तिम पहुँच तिथि: 29 November 2009.